Many of us feel a deep connection to Artists who have influenced and inspired humanity throughout history. Ever since I began journeying with Juerg 12 years ago, we have practised being open to allow our intuition to guide us to places and people, which resonate with our heart and soul. During several campervan journeys in France, Juerg and I had the opportunity to connect with many of the great Impressionist Painters – in particular, Claude Monet. These connections happened spontaneously over a period of about 2 months. It felt like we were guided to many locations, which were important for his life and work. Impressionism developed in Paris in the 1860s. Its influence spread throughout Europe and eventually the United States. The Impressionist Artists rejected the fine finish and detail to which most artists of their day aspired. Instead, they aimed to capture the momentary, sensory effect of a scene – the effects of light, the passage of time, changes in weather and other shifts in the atmosphere. To achieve these effects, many Impressionist Artists moved away from the studio to the streets and countryside, painting en plein air (outdoors). Many consider Claude Monet to be the founding Father of Impressionism. The term Impressionism derived from a painting by Claude Monet – a view of the port of Le Havre in the mist – “Impression, Sunrise” 1872. As from my early teens, Claude Monet’s tranquil garden and beautiful paintings have fascinated me. This was thanks to the influence and admiration of his work by my Grandmother who is a well-known artist and gardener in New Zealand – now over 90 years old. For a long time, it has been a dream of mine to visit Claude Monet’s home and garden in Giverny, France. Two years ago, this dream became a reality. The relationship I have with my Grandmother has enabled me to experience the depth and magic of an energetic, spiritual connection, which transcends time, distance and space. After visiting Claude Monet’s beautiful garden in Giverny, Juerg and I spent 3 weeks travelling the Normandy Coast in our campervan. Monet grew up in the major port city of Le Havre. The sea was a constant background of his whole childhood, and it is said that he spent more time roaming the beaches than in the classroom. During the 1880s, Monet rediscovered the Normandy coast and made repeated visits there to draw by the sea. He was attracted to the dramatic cliffs and unique rock arches. One of my most memorable experiences on the Normandy Coast happened only thanks to an argument I had with Juerg! (everything happens for a reason!…) 😊 Feeling emotional and annoyed, I went for what turned out to be an inspiring and magical walk on my own. Within about half an hour of walking, I found myself on top of a huge cliff overlooking an historic church and a beautiful, wild ocean scene. On my walk, I was surprised to find signposts describing details about the early years of Monet’s life spent on the Normandy Coast, as well as displaying several paintings he created of the ocean and coastal scenery. Monet created close to 100 paintings along this coastal area and often he would return numerous times to the same scene, until a painting was completed. My tranquil walk offered a beautiful and intimate soul connection with a man both myself and my Grandmother were so inspired by. Standing alone on top of the cliff, with no one else around, I experienced a timeless and expansive sense of the feelings and emotions, which Monet had captured in so many of his paintings. “Cliff walk at Pourville.” 1882. Art Institute of Chicago. When I finally returned to our campervan, I wanted to surprise Juerg. I suggested he follow me on the walk to experience what I had discovered in a similar, spontaneous way. Together, we followed another path past a small herd of content goats and down towards the beach. We found more signposts displaying paintings, which Monet had created of the beautiful coastal scenery we were witnessing. What followed this experience, was more fluid moments of synchronicity as we “happened” to arrive in many special places, scenes, and villages where Monet had produced some of his earliest impressionist paintings. Rapid brushwork and vibrant colours display images of sky, cliffs, sea and beach, which have become some of the most memorable and popular images in Impressionist art. Later, our journey lead us to the Art Museum Le Havre, which houses major Impressionist paintings from such artists as Claude Monet, Auguste Renoir, Alfred Sisley, Camille Pisarro and Eugene Boudin. Museum Le Havre is known as France’s best museum of Impressionist paintings after the Musée d’Orsay in Paris. “Fecamp, Bord de Mer” 1881, Museum Le Havre. The whole experience of many spontaneous, synchronistic and magical moments made me feel as if my Grandmother and Monet were there with me and guiding us on our journey. I gained a much deeper appreciation for the beauty of his work – especially the colour and light he portrayed based on the landscapes he knew so well. Monet was fascinated with the changing effects of light in nature. My Grandmother – Joan Elder – in her Garden in New Zealand (several years ago now). Growing up in New Zealand, I was very inspired my Grandmother’s passion for painting. My Grandmother loved to be outdoors – painting or sketching in nature. Some of her subjects included rural farm scenery with early pioneer cottages from our region. More often, she painted plants, flowers, trees, pathways and picturesque, tranquil scenes from her own garden. Sometimes, we went on painting and drawing excursions together. However, it was only after my experiences in France that I began to appreciate why my Grandmother was inspired all her life by the work of Claude Monet – both his paintings and amazing garden. Throughout my life and especially in my early 20’s, I cherished the company of my grandmother in the sanctuary of her garden. Her beautiful garden was well known and often visited by garden enthusiasts from both New Zealand and overseas. There were many times that I felt she was the only person in the world who would truly listen. She was not only a grandmother, but a wise friend and honest, sincere companion. My grandmother and I shared many magical times together and I remember always leaving her garden with a bunch of beautiful flowers, herbs and a lighter, brighter feeling in my heart. Looking back, I know it was her devotion, humility and gratitude for the small things, which made her simple life connected to nature so rich, self-sustaining and rewarding. My grandmother always told me to follow my heart and that it did not matter what anyone thought of the decisions and choices I made. She helped me to see that many people may not understand my journey, but the most important was that I was happy with my choices and true to my heart. During my life away from New Zealand, I would often phone my grandmother and she would say to me, “Jaymie, I’ve just been thinking of you!”. She would also say this whenever a letter arrived in her mailbox from me. When I call her on the phone from Europe, she always says that I sound so close, like I am in her next bedroom. 🙂 Today, I may not be in contact with her as much as I would like to, but I know and feel that when I am thinking of her, she is feeling it and likewise thinking of me too. We are infinite, multi-dimensional beings experiencing life though a physical earth-form. When we fully embrace our spiritual being, we know and feel we are NOT limited by time, space or our physical bodies. 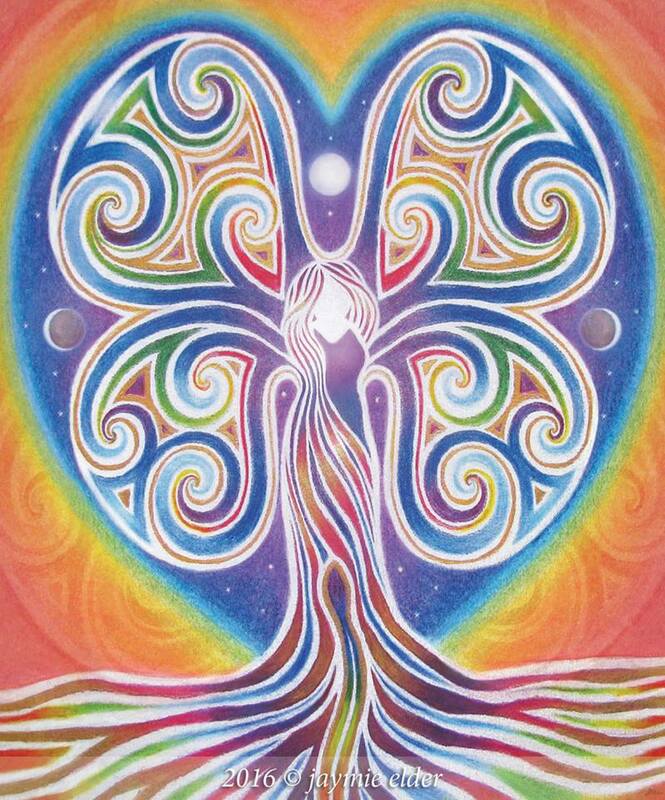 When we think of someone, we feel love in our heart chakra and this energy instantly reaches the soul of the person we are connecting with. In my early twenties, I learnt about distance and energy healing through Reiki courses. However, it is only now thanks to my own experiences and journey, that I understand what this means on a much deeper level. There is so much more to our being and our world, which we do not see with our eyes and cannot grasp with our limited human understanding. For the past 16 years, I have been on a journey to reclaim and heal the part of myself, which I call my innocent child. She is the free spirit within me that was and still is very connected to Nature. My innocent child believes, feels and sees magic and wonder – all around her. It is through her that I experience a world interconnected by a divine, creative force. I am grateful for the teachers in my life (my grandmother, Juerg) and many others who have helped me on this journey of reclaiming, healing, learning and growing. I have realised on my journey that sometimes a soul family member can help us the most by NOT “being there” for us, either physically or emotionally. This is because we are then forced to dig deeper within ourselves to understand the true origin of our pain and longing. It is through our inner work of healing, understanding and personal growth we can connect more deeply with our spiritual essence, our true self, and the love and wisdom in all of creation. At some stage, we come to realise it is “thanks” to the people who “left” and “hurt” us that we have embarked on the journey to reconnect with the deepest part of ourselves – our soul, spirit being and our true, creative and divine purpose. In Monet’s final years, he increasingly suffered from cataracts. He was often fearful of becoming completely blind. It became harder for him to work outside, so instead he built a large studio on his property in Giverny and began to paint the vast, abstract canvases known as “The Grand Decorations”. These masterpieces are 91 meters long (almost 300 feet long). They are two meters high, which is as high as Monet could paint when he stood. Two rooms were eventually necessary to accommodate them and they took him close to 10 years to complete. Monet died of lung cancer on 5 December 1926, at the age of 86. Monet’s home, garden, and waterlily pond were bequeathed by his son Michel, his only heir, to the French Academy of Fine Arts in 1966. Through the Fondation Claude Monet, the house and gardens were opened for visits in 1980, following restoration. The house and garden, along with the Museum of Impressionism, are major attractions in Giverny, which hosts some 500 000 visitors each year during the open season of seven months. My soul connection with my grandmother and Monet will continue to inspire me on my journey. One day, I would love to visit the massive Impressionist paintings of waterlilies, known as the Grand Decorations, in the Musée de l’Orangerie in Paris. Time will tell if this dream will become a reality! The purpose of this post is not only to share my experiences of connection between Claude Monet and my Grandmother. I wish to encourage others to dream, open, be inspired and follow their own soul guidance, especially if that means reconnecting with an Artist, Writer, Actor, Musician, Philosopher (or any person who has made a positive and profound impact on humanities consciousness). Any time we feel real love or passion for an Artist, there is something important trying to be made conscious in regards to our own soul journey. Jaymie Elder is a soul journey guide, artist, photographer and traveller offering intuitive guidance/sessions internationally via Skype. Jaymie is dedicated to supporting others to heal and grow towards their authentic self – and a life in harmony with their heart and soul being. Learn more about Jaymie and her work here. Any time we feel real love or passion for an Artist, there is something important trying to be made conscious in regards to our own soul journey. Previous Only your heart and soul can guide you to the truth.